Toronto expected to feel nearly 30°C warmer in the next 48 hours - Canada Eh? As all of southern Ontario remains under an extreme cold warning today, one thing remains on everyone’s mind: When is the bone-chilling weather going to come to an end? While freezing temperatures remain on the forecast for today, we’ll thankfully be able to feel our fingers and toes again in a few days. According to Environment Canada, with the windchill in effect, it currently feels like -31°C in the city. 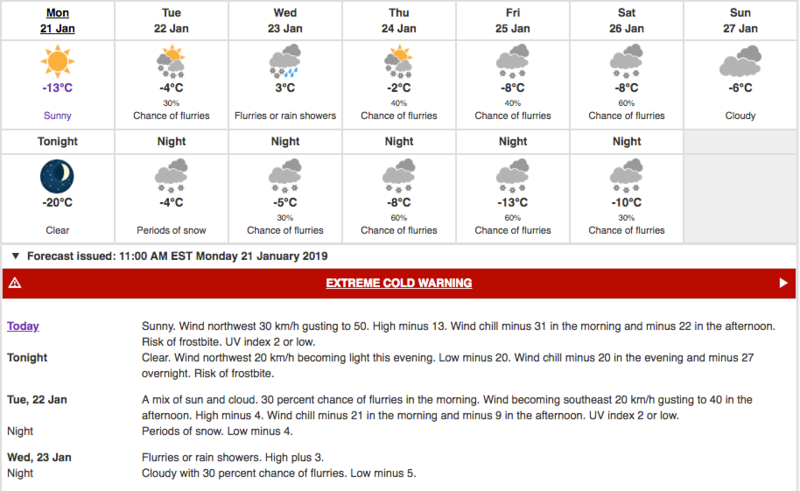 Which is what makes it so remarkable that Environment Canada is also predicting a high of 3°C for this Wednesday, January 23. Between now and waking up in fewer than 48 hours, the city is looking at a potential 28°C temperature swing. And with -20°C forecasted for tonight and snow expected for tomorrow, this news really couldn’t come at a better time. But in the meantime, make sure to bundle up and stay warm. Better days are coming, Toronto.